I've been in Chhattisgarh (earlier it was part of Madhya Pradesh, mp) for 27 years. I came here to work in a community-based rural health centre in Hoshangabad district in mp. Initially my work focused on tuberculosis patients, but then, through my association with the activist Shankar Guha Niyogi, I came in contact with mine workers. I began working with miners in Dalli Rajahara (Durg district) where on the urging of union leaders, I helped set up Shaheed Hospital, a low-cost hospital that's still owned and managed by workers. From there I moved to a missionary hospital in Tilda, near Raipur, where I trained village health workers. In the 1990s with my wife, Illina, I started a trust called Rupantar in Raipur that trains community health workers in remote villages. The workers promote food security and also campaign against alcoholism and violence against women. For the past 18 years we've worked in villages inside forests set up by people displaced by dams on the Mahanadi river--villages that didn't exist on paper. In those villages, people depended on local shamans or quacks. Malnutrition, malaria and diaorrhea are common ailments. However, since I've been out of the loop for over a year, I can't say what the situation is right now. What's the relation between healthcare and development? While working in the villages, I was all the more convinced that healthcare couldn't be effective on its own and had to be connected with other efforts to improve food security, housing and increase employment. In the same sense, development has to include healthcare. My criticism of the Salwa Judum movement led to my arrest. [In December 2005, Sen led a 15-member fact-finding team from different civil and human rights organizations and published a damning report on the state-supported anti-Naxalite movement]. But even before that, I was among the first investigate encounter deaths in Chhattisgarh. The state labels anyone who doesn't agree with its policies a Naxalite. I've been accused of being a conduit between Narayan Sanyal (a veteran Naxal lodged in Raipur Jail) and other Naxal leaders. But my interactions with Sanyal have been only in the capacity of a human rights activist. He asked me for help and I couldn't deny him that. Everybody has the right to legal aid and medical care. 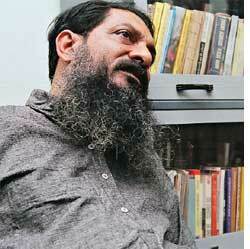 I met Sanyal several times in jail, openly. It's all in the files. I arranged for his medical treatment and helped find him a lawyer. Prior to this you had a cordial relation with the government? Yes, I was an advisor to Jan Swasthya Sahyog, a government health care organization committed to developing a low-cost, effective, community health programme in the tribal and rural areas of Bilaspur district. I was also a member of the state advisory committee that was instrumental in setting up the Metanin programme--a community-based health worker project. Your work in rural areas must have brought you in contact with Naxalites. Did you sympathize with them? The Naxals managed to set base in villages because of the total absence of government infrastructure in these areas. The rural poor have very valid grievances against the state and the Maoists tapped into these. However, I don't condone the Naxals. I don't approve of their violent methods. In fact, I've spoken strongly against them several times. I'd like to say three things. First, this case has no basis and I want it to end as soon as possible. I'm 58 years old, I haven't given my family much attention all these years, I want to spend time with my wife and children.Second, Salwa Judum has to end. It has created a split in the tribal community. It will take a long time for the rift to heal. Third, establishing peace should be the first priority. I think we need to work to bring all parties to the negotiating table. It is the first thing I will work towards after I get out of here.